This waterfall looks like a quintessential tropical paradise - a hundred meter high torrent of water plunging into into a picturesque pool of water. Though most people don’t reflect on the fact, this is one of the tallest waterfalls on the island. 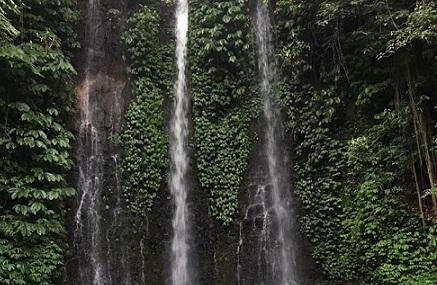 It’s about an eight hundred meter walk from the parking lot to the falls, and you should be careful not to slip on your way down, especially during the rainy season. However, that is also the best season to visit. Bring a change of clothes as you are almost certainly going to want to bathe in the pool. On your way back, before you leave the village, try and get coffee from the cafes here. They beans they use were grown in the nearby plantations. Drive to the waterfall car park in Pupuan Village. Hike 800 meters to the waterfall. How popular is Blahmantung Waterfall? People normally club together Banjar Hot Springs and Pura Luhur Batukaru while planning their visit to Blahmantung Waterfall. Getting to this waterfall is quite an adventure. Not for the faint of heart. If you are after an adventure, then give it a go. Beautiful. Super hard to get too. Very pretty. We were alone there. The water is cool and fresh. Quite difficult to find, we had to pay a local to guide us.